Just like a small child who is learning to walk needs help to take its first steps, a young business needs help to get started. Many small businesses fail even though young entrepreneurs have the knowledge and skills to run their own businesses. A study by the Umsobomvu Youth Fund has shown that this is because young people lack business experience and mentors. A mentor is someone with a lot of experience and skills who helps a younger inexperienced person. In a new business the mentor plays an important role in getting the business started. The young entrepreneur learns from the mentor how to run the business successfully. 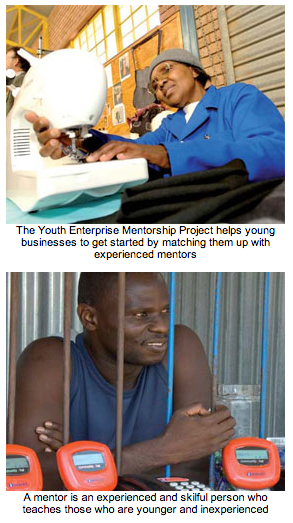 The Youth Enterprise Mentorship Project was started to get mentors for young business people. The aim is to help them develop their business ideas, knowledge and skills. If necessary, the mentors will give advice even after the businesses are up and running. Young business people who need a mentor have to apply to Umsobomvu. 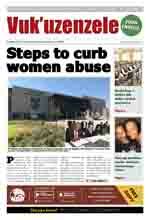 Depending on the kind of help they need, Umsobomvu will then match them with a professional mentor. They will look at things like the type of business, the problems they have and where the business is located. The mentors on their database include experienced business people, business consultants, senior and middle managers and postgraduate students with business experience. The mentors provide services like one-on-one mentoring, general business mentoring, specialist mentoring, group mentoring and peer mentoring. Services are matched with specific needs. For example, for a specialist industry like a restaurant, a mentor who has a lot of experience in this field will be appointed. The mentorship programme lasts for a period of two years. Apart from the mentorship project, Umsobomvu also started the Business Development Services Voucher programme for young entrepreneurs. To qualify for this programme, males must be between 18 and 35 years old. Women of any age can apply. The programme gives help in the form of money vouchers. The vouchers are used to pay professional service providers for support services given to the businesses. These include services like accounting, bookkeeping, marketing, branding and design of business forms, and business and financial administration.